The press arrives to grab images of the Giant Tire. A tent was set up for the 50th celebration. A security fence surrounds the tire. How most people see the Giant Tire as they drive to Detroit. The 12-foot high fence and the razor wire suggests the tire is a desirable destination to the univited. The 50-year old tire was last updated in 2003. A Michelin spokeperson said they occasionally have to pull arrows out of the tire. It looks like rubber, but it isn't. 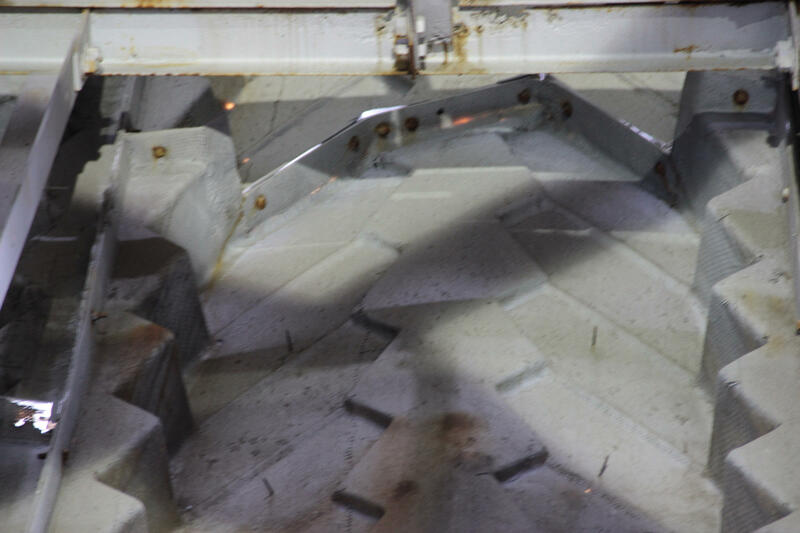 The base of the tire today - no longer a Giant Tire Ferris wheel. The tire was opened up to the press for its 50th anniversary. The entrance to the Giant Tire. The structure holding it up - first designed by the architectural firm of Shreve, Lamb and Harmon - designers of the Empire State Building. The tire tread as it looks from the inside. The route to the top of the tire. I go up as other reporters and the mayor of Allen Park, William Matakas (center) look on. Higher up in the tire. Some steel that holds the whole thing together. Light shines through the skin at the top of the tire. Inside the top of the tire. The hatch at the top of the tire. 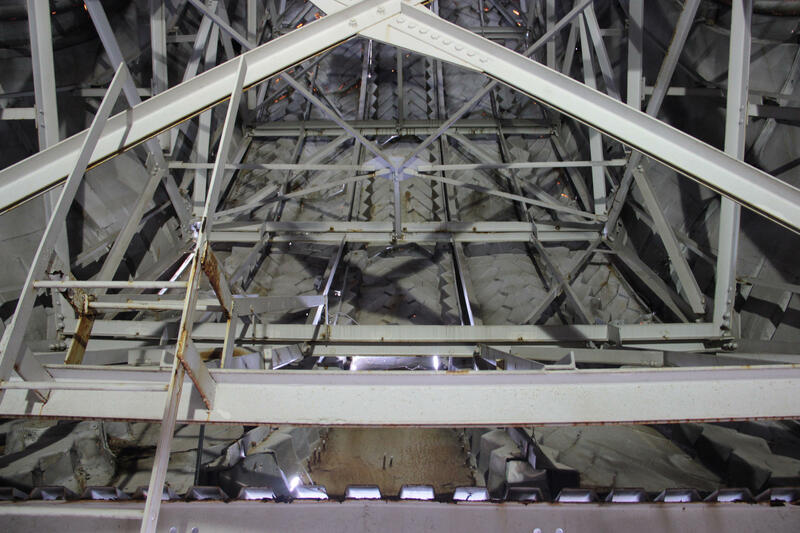 The hatch opens and the view from the top looking southwest. Gotta take a selfie on top of the Giant Uniroyal Tire. On top of the Giant Tire looking west down I-94. Looking east from on top of the Giant Tire. On top of the giant tire looking north. Another view looking east down I-94. Looking east down I-94 toward Detroit. Light for low-flying aircraft atop the Giant Uniroyal Tire. A view from the inside of the Giant Tire. The tire is metal and was moved in sections to its current home in Allen Park. The Giant Tire celebrates 50 years. Not the biggest tire, but the biggest replica of a tire. 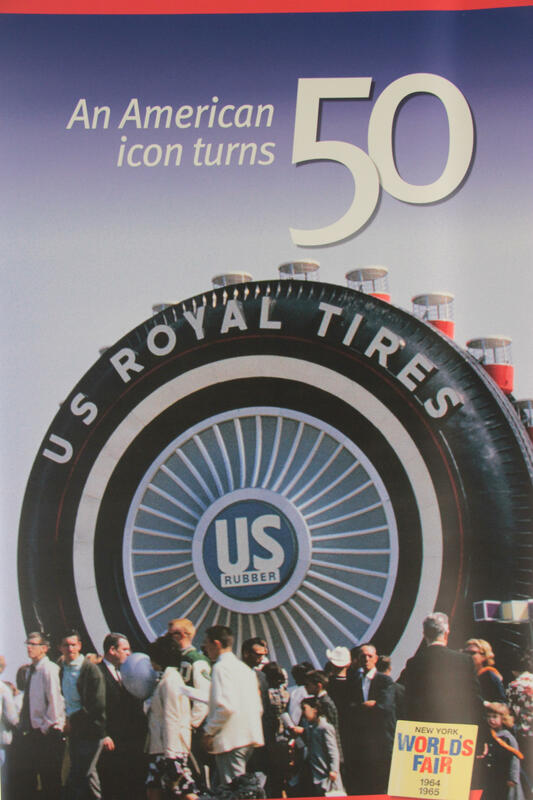 When we heard that the Automotive Press Association was holding an event to celebrate the 50th anniversary of the Giant Uniroyal Tire along 1-94, we couldn’t resist. Not only because, well, it’s the GIANT TIRE – who wouldn’t want to see inside of it?! – but also because it gave us a chance to look into a question put to our M I Curious page. When we contacted him, Uptegraft said as a professional driver who deals with bridge clearances and logistics all the time, he wanted to know more about how they moved the tire back in 1965. "My understanding is that this is a real tire and does not just come apart." Uptegraft specifically wondered how they got that giant tire under bridges when it traveled by train from New York City to Allen Park, Michigan (right outside of Detroit). Like Uptegraft, I’d always heard that the Giant Tire was the “world’s biggest tire” – meaning that it was a real tire - a giant, 80-ft tall, real-life rubber tire. On top of the Giant Uniroyal Tire. When I clambered to the top of it yesterday and touched it, I didn't feel rubber. I felt steel and fiberglass. I was told the hatch at the top was heavy, so you had to push hard to open it. 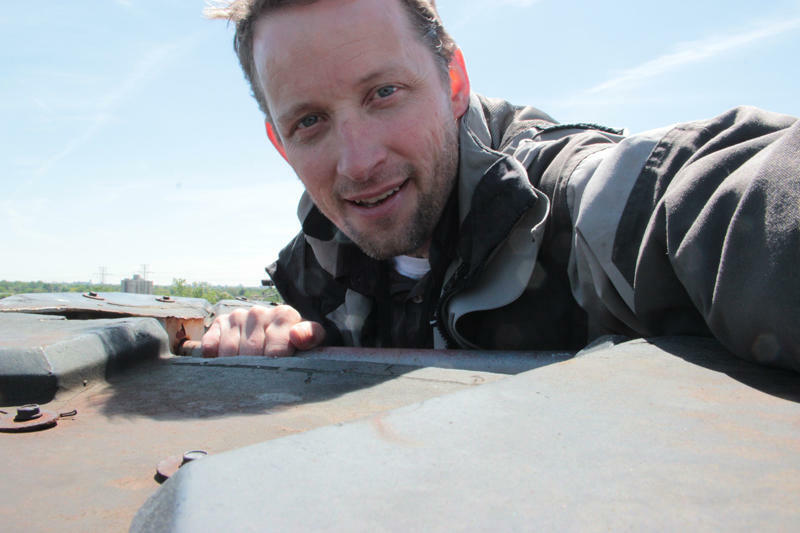 The reporters 80 feet below likely got a sense for the tire's non-rubber hull when I flung the hatch open with a loud CLANG! that echoed throughout the inside. Ray Fischenich, Michelin’s Uniroyal brand manager, confirmed it. It’s made out of metal. "Some people have shot arrows at the tire. I don't know. I guess maybe to try to deflate it." “Some people have shot arrows at the tire. I don’t know. I guess maybe to try to deflate it. It’s actually made out of steel, so it’s going to handle the arrows pretty well, but we have to have people come in and take the arrows out,” said Fischenich. We’re talking about the world’s biggest replica of a tire. It was first built as a Giant Tire Ferris wheel for the New York World's Fair in 1964. Ten cents would get you a 10-minute ride in one of the four-person gondolas and a "spectacular view of the fairgrounds." When the fair ended, it was taken apart and moved. Inside the Giant Tire, when you look close, you can see it's made up of sections. A closeup of a section of the tire. It was taken apart and moved by rail from New York to Allen Park, Michigan in 1965. When the fair ended in 1965, the tire was shipped by rail in 188 sections to Detroit. It was reassembled in four months and anchored in concrete and steel off I-94 at the tire company’s Allen Park, Michigan, sales office. So if anyone out there has some historical images of the Giant Tire’s move from New York to Allen Park, let us know, or share them below. For now, Fischenich suspects the move was pretty uneventful. He says they obviously didn’t have any trouble moving it, and he believes all the pieces fit inside the rail cars. The tire is not open to the general public. It's on private land and it's surrounded by a 12-foot chain-link fence with razor wire (that tire is NOT escaping). So a chance to see it up close was a treat - especially for those who remember riding on it in New York. Jim Bianchi remembers going to the New York World's Fair in 1964 and riding on the Giant Tire Ferris wheel as a 10-year old boy. "It was pretty much like riding on any other Ferris wheel, but it was kind of cool especially for somebody that was from the Detroit-area and growing up around cars and the car industry." Bianchi grew up in Allen Park. Today he says he always points the tire out to people. "I really do feel a sense of connection on it. Every time I've driven by the last 50 years I've pointed to that and said, 'Oh, I remember when I was on that when it was a Ferris wheel as a kid,' said Bianchi. "So it's kind of cool to see it still up and being honored today." Scroll through the photos above to see what it’s like inside and on top of the Giant Tire. *This post was updated to clarify that the replica tire also is made up of fiberglass.